An eloquent modern writer has declared, with a good reason, that even if all other records had perished, “anyone with skill to analyse the language, might re-create for himself the history of the people speaking that language, and might come to appreciate the divers elements out of which that people was composed, in what proportion they were mingled, and in what succession they followed one upon the other.” From a careful analysis of the names of the more prominent features of the land; of its divisions, its towns and villages, and even its streets, as well as the nomenclature of its legal, civil, and political institutions, its implements of agriculture, its weapons of war, and its articles of food and clothing, — all these will yield a vast fund of history. I, Patrick, a sinner, a most simple countryman, … had for my father the deacon Calpurnius, son of the late Potitus, a priest of the settlement of Bannavem Taburniae; he had a small villula nearby where I was taken captive. I was at that time about sixteen year of age… I was taken into captivity in Ireland with many thousands of people. 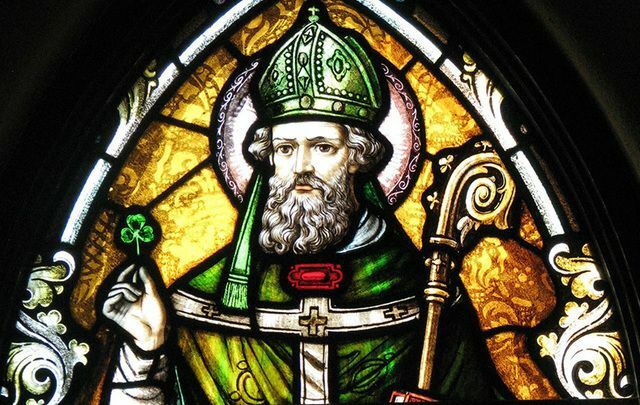 Here we learn how Patrick was taken to Ireland by some kind of slave raid – so his home must have been within striking distance of the coast. We also discover that his father, Calpurnius, was a Christian official called a ‘deacon,’ & he was connected to the settlement of Bannavem Taburniae. Finally, we learn that near Bannavem lay was the family villula, which translates as the country house of a farmstead. On first examination, the name Bannavem Taburniae seems corrupt, & indeed c.700 AD, the situation was clarified by Patrick’s hagiographer, Milúch, who tells us, ‘this place, as I am informed beyond hesitation or doubt, is Ventre.’ This lets us create a new name-combination for the boyhood home of Patrick, being; Banna Venta Burniae. There is another Bannaventa in Britain, near the village of Norton in Northamptonshire, & is named thus in the mid-second century ‘Itinerary’ of Antonius Pius. What we may logically conclude is that the second Bannaventa came later, with an addition of ‘Burniae’ applied for the purpose of differentation. A.D. 931. This year died Frithstan… and Brynstan was blessed in his place. & in Saxish he gan speak the names of the men. 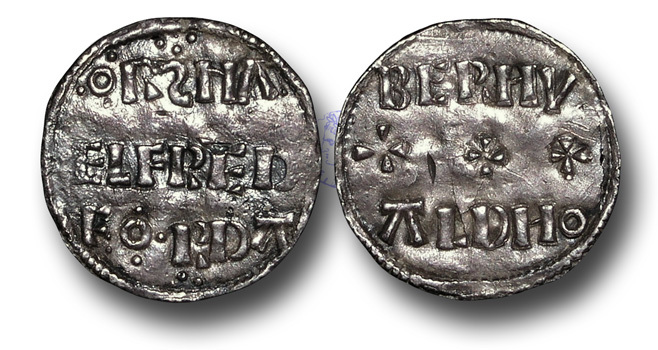 Numismatic support for an earlier ‘burn’ comes upon coins minted by Athelstan’s father & grandfather – Alfred the Great – which give the moneyer’s name as Bernvald. Such knowledge allows us now to create with confidence a slightly different name for Patrick’s boyhood home; Banna Venta Bruniae. Later in the 930s, in 937, the Anglo-Saxon Chronicle records the Battle of Brunanburh. 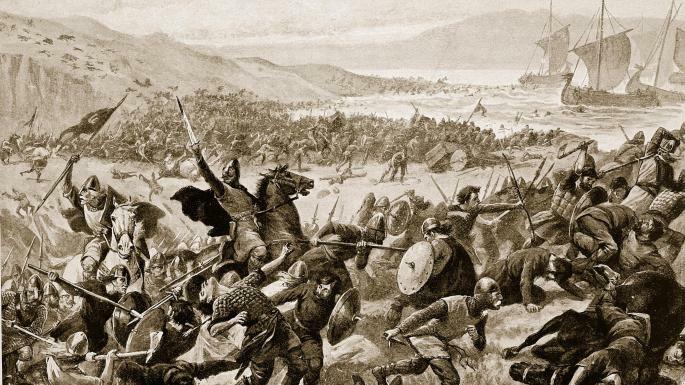 This epic conflagration saw King Athelstan of England defeat a confederacy of Vikings, Scots & Northern Britons. Variant names for the battle are given by Symeon of Durham – Wendune/Weondune – & the anonymous Scandinavian text, Egil’s Saga – Vinheath. These alternative names have proven problematic to academic inquiry, but may now be reconciled with the Brunanburh name through Patrick’s Banna Venta Burniae, locking these two historical jigsaw pieces fast together. Furthermore, both the ‘dune’ & ‘heath’ elements of Wendune & Vinheath mean the same as banna: pinnacle, peak, mountain, bare hill, etc. A little extra glue comes from the fact that just as Milúch describes Banna Venta as being ‘a place not far from our sea’ – i.e. The Irish Sea – so after the battle of Brunanburh, the defeated Vikings fled to their ships & entered the Irish Sea on the same day as the battle. I don’t have the space to offer a complete survey of the Brunanburh case, but there can be no doubt that wherever the battle was fought, on account of covering both Dark Age bases, the boyhood home of Patrick must be now be the leading location. As to where this was situated, there is a great deal of evidence both subtle & blatant that points to Burnley as being the area in which the Saxon fortified ‘burh’ of Brunanburh once stood. 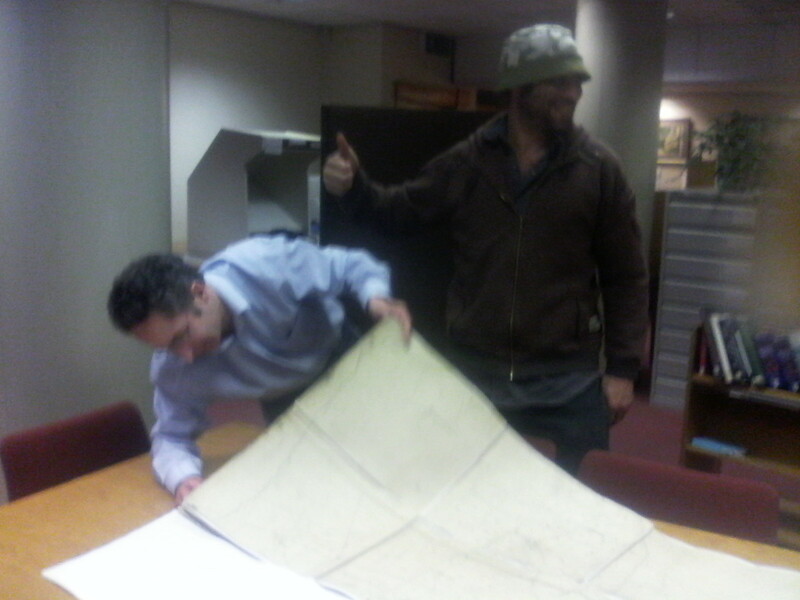 Quite tangibly, its trenches can still be made out to this day at a place called Castle Hill near Townley Hall. Castle Hill lies on the round hill just behind Townley Hall. An Anglo-Saxon burh formed the central administrative point of the administrative ‘Tun,’ from which we get the name Tunlay, & thus, Townley. 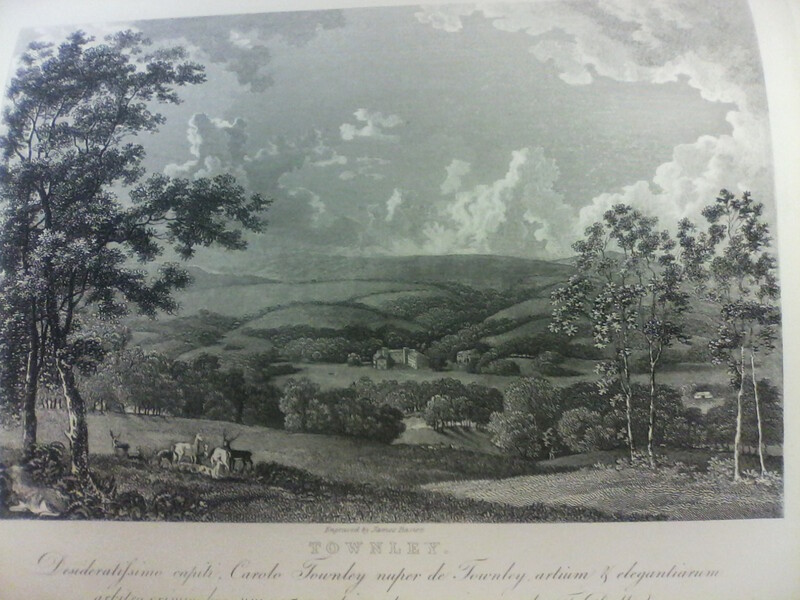 In the 12th century, Towneley formed part of an ancient township called ‘Tunlay-with Brunshaw,’ with the latter name meaning ‘Brun’s Wood.’ The clearing, or ‘lea,’ in this wood would eventually become Brunlea, & if my calculations are correct, the name-flip from Burn to Brun instigated by Athelstan in the 10th century would last last more than three centuries 0 before reverting to its original form in the late 13th century as Burnley. Further back in the first millennium AD, evidence for Roman settlement in the Burnley area leading up to the birth of Patrick comes in the name of the town of Colne, which appears as Calna in a charter of Henry I. This leads to the the Ravenna Cosmography Calunio, placed in the right area of Lancashire between Ribchester & Ilkley. When analyzing its history, we should notice that in the lists of Northern Roman camps, Calunio was not in existence in the time of Ptolemy (2nd century AD), but exists in the 6th century, when it appears in the Ravenna Cosmography. To the north, at Barnoldswick, ran a major arterial Roman road, from which minor roads branched into the Burnley area, such as the one that goes past Portfield on Pendle – the ‘Ad Alpes Peninos’ given in Richard of Cirencester Itineray – passing the villages of Sabden & Newchurch on the slopes of the same hill, down into Barrowford, along Wheatley Lane, up again to Castercliffe hill fort – which may have been Calunio itself – & then on into Yorkshire where it concludes at Ilkley, given as Alicana in the Roman geographies. There are also traces of another road that goes through Burnley itself, up to Cliviger, then over the moors to Slack, near Huddersfield, where the ‘Cambodnum’ Roman fort is sited. 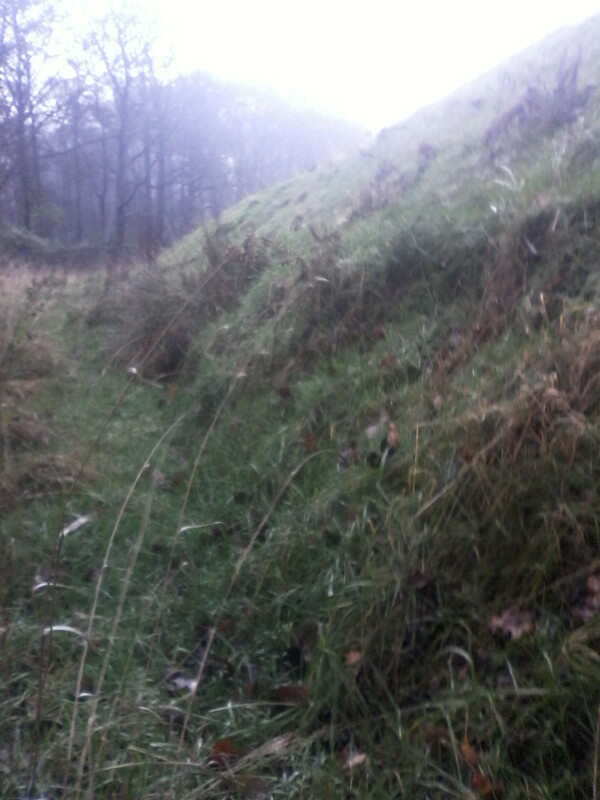 Numerous Roman coins have been found in the Pendle-Burnley area; in the sunken lane at the foot of Castercliffe, at Wheatley lane, in Burnley & finally at Emmot, near Colne, where according to TT Whitaker, writing in the year 1800, ‘a large silver cup filled with them was turned up by the plough in the latter end of the 17th century.’ Speculating further, Roman forts were generally attended on by the local population, who lived next to or near the fort in a settlement described as a vici – the semantics of which can be observed in the name, Wycoller, a time-capsule village just to the east of Colne. These variants connect neatly with the Vinheath of Egil’s Saga, which in Burnley terms links to the hamlet of Winewall near Colne, & I am quite sure the Battle of Winwead was fought at Barrowford. The last sentence is key, for it places the Wends in Britain at a place well-sited for handling a rebellion, suggesting a northern location. If this was in Lancashire, we can understand the proper origins of a number of Probus coins found in the county; such as at Worden, on the outskirts of Leyland, whose name also seems a variation of ‘weodune’ Similar coins were also discovered at Burnley itself, where WT Watkin describes 126 copper coins known as ‘radiates’ of the late third century AD, while the coins found at Castercliffe were minted at the same period. 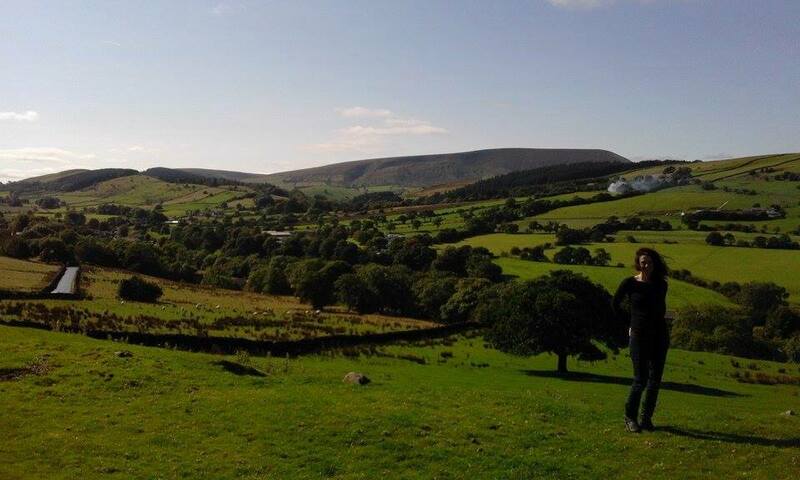 My wife at Pendle, a couple of miles from Roughlee. 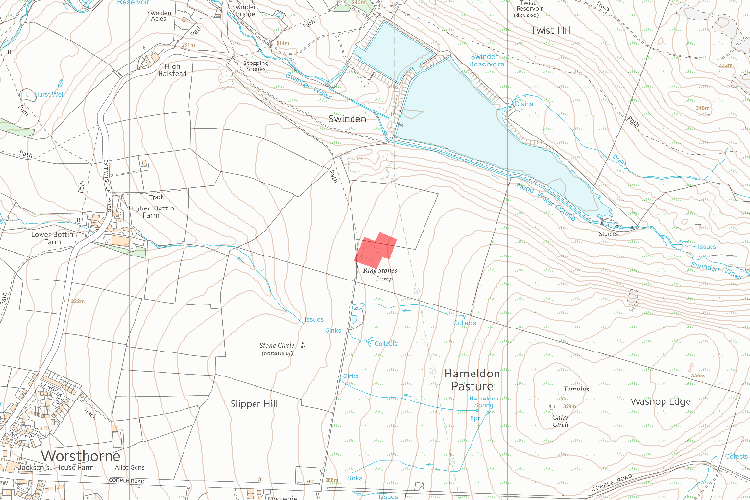 Ring Stones camp is located near a certain Swinden Resevoir, whose name clearly contains the ‘wendune’ semantics. 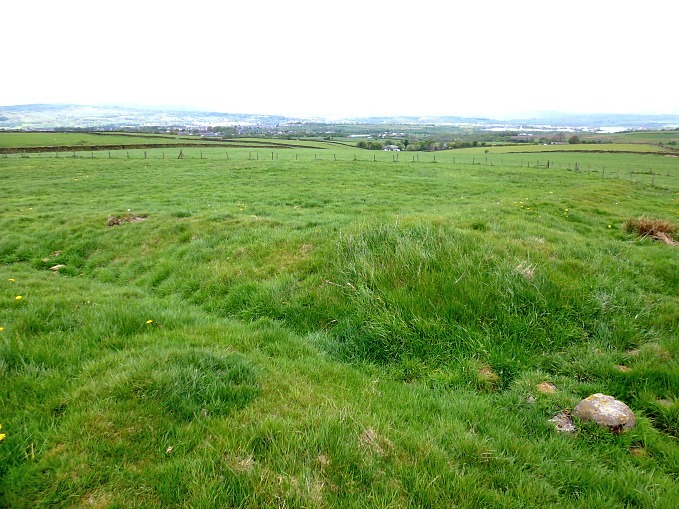 It has been dated to the Fourth century on account of its great physical similarity – especially an identical gateway – with ‘Bomber Camp,’ sited by a Roman road near Gisburn, where a collection of early to mid Fourth Century pottery was unearthed. Just to the north of Swinden reservoir, at Twist Hill, there also stands another Roman-British farmstead, 44m by 40m. A bronze coin of the Roman emperor Marcus Aurelius (AD 161-180) was reportedly found here in 1888, which is much earlier than Patrick, but shows an even earlier settlement of the area. It is at this point that I will add a wee drop of speculation into my theory, I always enjoy finishing thusly, for the close connection between the camps at Gisburn & Roggerham may be in fact down to an actual human familial relationship. Where the Hymn of Fiacc tell us Patrick was; ‘Grandson of Deochain Odissus,’ a few miles to the west of Gisburn, in the delightful Forest of Bowland, we may see a River Dunsop – possibly connected to the ‘Sorbs’ – flowing into the River Hodder, which might just have been named after Odissus. To summarise, a large Romano-British farmstead building was erected at Roggerham in the 4th century which fits the country estate image given by Patrick’s ‘villula.’ Roggerham lies near Burnley, which matches the Burniae element of Patrick’s boyhood home. Burnley seems to have been the site of the Battle of Brunanburh, also named Wendune, which translates perfectly as Patrick’s ‘Banna Venta.’ The only speculative thought is Burnley’s identification as Brunanburh – but if the battle was fought near that bonnie Lancashire town, then its clearly a case of killing two birds of mystery with one scholarly stone – & a few archaic words.